"Luann, your participation in our recent seminar was just what we needed. Your presentation was the only one to receive 100% ratings of excellence! Everyone was definitely engaged." Nonprofit Connect offers custom training for nonprofit organizations and their board of directors. Our customizable training programs can help your organization strengthen your team, get board members on the same page, and ultimately help you meet your mission. We recognize that every organization has unique needs, so we offer both established and custom programs. Training can be offered at your location of choice, or at Nonprofit Connect's office. We can also provide a speaker for your event or conference on a wide range of nonprofit topics. Board retreats are a good time to review organizations accomplishments as well as receive a refresher course on the roles of directors and staff. We will provide the responsibilities of the board as defined by BoardSource, along with current board best practices. For longer presentations we can add a workshop that engages the board in defining their way forward by understanding the organization’s “why”. Customized programs can also incorporate the DiSC Behavioral Assessment to ensure the board is working cohesively. A staff retreat provides an ideal environment for self-assessment and team building. Individuals take an online assessment prior to the workshop to gain insight into their DiSC Behavioral Assessment style. In the retreat, the participants engage in discussion on their style, the styles of their team members, and how their styles play out in their workplace interactions. Discussions center on the benefits and challenges of each style, and how the different styles impact the team and the workplace culture. Participants learn strategies to leverage their style differences to improve communication, trust and team performance. 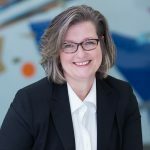 Luann Feehan, Executive Director of Nonprofit Connect, is a Certified BoardSource Governance Trainer and DiSC Behavioral Assessment Trainer. She brings over twenty years of experience in leading successful nonprofit teams. Pricing is based on the extent of customization and the number of participants. Nonprofit Connect members receive a discount. Click here to learn more about membership. Do you need a keynote or breakout speaker for your event or conference? Nonprofit Connect can provide expertise on topics including nonprofit board development, board training, community involvement, and more. Want more information on custom training or speaking engagements?